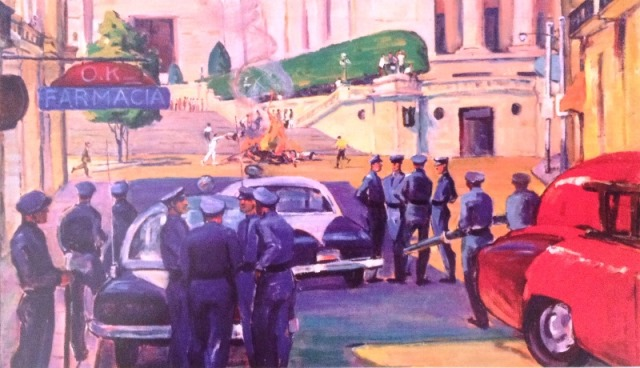 On March 13, 1957, a group of students from the University of Havana launched an attack on the Presidential Palace in a bold attempt to overthrow military dictator Fulgencio Batista. The leader of the group, José Antonio Echeverría, who was also the President of the University Students Federation (FEU in Spanish) at the time, was slain by the police only steps away from the staircase leading into the University of Havana campus. He was only 24 years old. José Antonio Echeverría was born in Cárdenas, Matanzas province, Cuba, in 1932. He enrolled in the School of Architecture at the University of Havana in 1950. He was elected President of FEU in 1954 and was a founding member of the Directorio Revolucionario Estudiantil (DRE), a militant organization that played a key role in the popular movement to oust Batista from power. The Cuban Research Institute has convened a symposium to commemorate the historical context of José Antonio Echeverría's life and role in the anti-Batista insurrection in Cuba during the 1950s. Confirmed participants in this event include Mr. Richard Denis, an FIU graduate in international relations; Ms. Lucy Echeverría, President of the José Antonio Echeverría Foundation; Dr. Javier Figueroa, a retired Professor of History at the University of Puerto Rico, Río Piedras; and Dr. Lillian Guerra, a Professor of History at the University of Florida. The event is free and open to the public. For more information and to RSVP, please call (305) 348–1991 or write cri@fiu.edu.